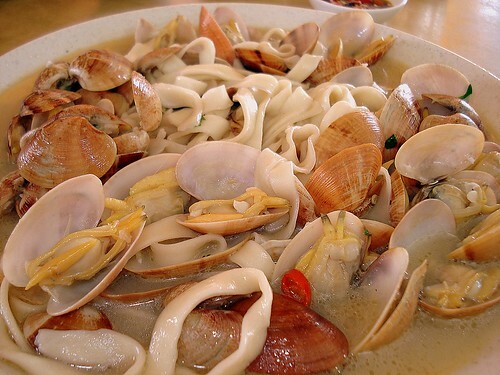 "Vongole noodles" aka lala ban mian, originally uploaded by Camemberu. I met Keropokman, his lovely sister and Southernoise today for lunch at Ya Kwang Dai Pai Dong. This was planned from way back, when Southernoise first mooted the idea of requesting extra large crabs for the delicious crab tanghoon. As you can imagine, we gathered with great anticipation! Alas, the crabs reserved did not arrive in time today and Jason (shop boss) did not recommend the crabs available (not fleshy enough). So, we opted for the clam noodles instead. The "vongole" as someone put it, although it actually features "lala" clams instead of white clams. Cooked in a savoury wine broth, it was umami and addictive. We were glad we went for a double portion of clams! The tagliatelle-like noodles is the floury, wheaten "ban mian" which does a good job of soaking up the stock. They were cooked al dente, which is unusual for ban mian but not in a bad way. 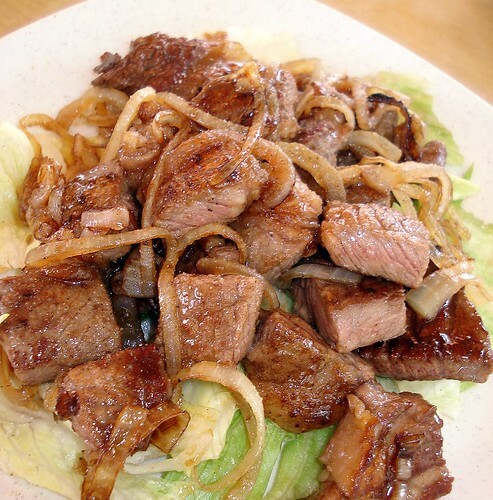 Ribeye teriyaki, originally uploaded by Camemberu. How can we not have the ribeye teriyaki when at Ya Kwang? Juicy cubes of flavour, caramelised on the surface but wonderfully tender inside. We were joined shortly by ieat and his family. Of course, every time ieat goes to Ya Kwang, some new dish is concocted. This time it was beef teriyaki hor fun, which was not bad when eaten hot on the spot. I got to try a bite of the Korean tanghoon (ieat had it done with prawns instead of crab) - the texture is really bouncy and chewy and yet the clear noodles had soaked up all the flavour. 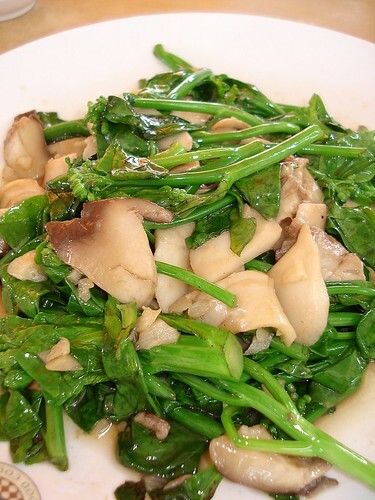 Some vegetable (kai lan tops) with mushrooms, originally uploaded by Camemberu. I'm not sure what this vegetable is - kai lan florets? Mildly bitter taste but nicely paired with mushrooms in a garlicky stirfry. Gotta have your greens! 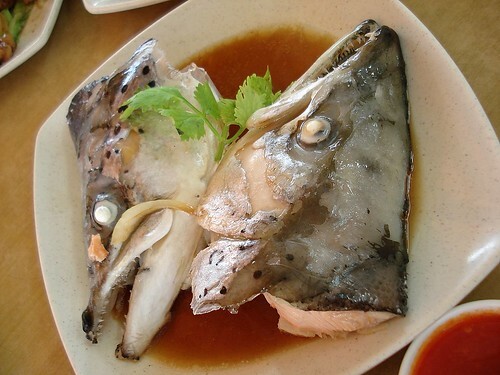 Steamed salmon head with light soy, originally uploaded by Camemberu. Jason repeatedly recommended his steamed salmon fish head (S$5), so we gave it a go, despite a) not being fish head aficionados and b) preferring salmon raw, or at least grilled if cooked. Well, it fared all right for what it is but isn't what I'd leap for again. I was very surprised Nadine liked this and that she kept asking for more. There was a natural salmon fishy taste but I could tell this fish was reasonably fresh, unlike the one I had at Absolute Haven. Jason had to carve it out for us because we were sooo slow at deconstructing the fish. He kindly gave Nadine the prized cheek, which was particularly soft! Fortunately the others seemed to appreciate their portions of eyes and gelatinous skin. 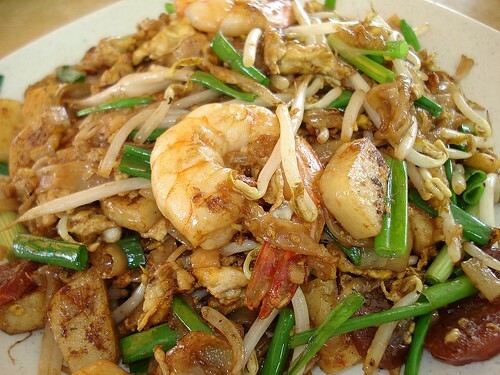 Penang style char kway teow, originally uploaded by Camemberu. Mmmh, this one tasted better than when I last had it! The Penang char kway teow (S$4) had more flavour and was chockful of fresh ingredients. A most worthy plate of greasy carbs. Oh we also had crispy chicken wings (S$5) but I forgot to take photos (hands full with Nadine!). I liked the chicken wings (midjoints used) more than I thought I would. Really crispy with a slight hint of curry. Passed the GBD test (Golden Brown and Delicious)! Specials menu along with photos of dishes, originally uploaded by Camemberu. Ah, Jason's put up some semblence of a menu here now, along with large photos of certain dishes. He's also very amenable to suggestions if you have special requests (unlike Sin Huat just two lanes down). Food here in general is not bad and good value for money. I enjoyed meeting my fellow hometowners and hope we get to pig out again someday! P.S. Keropokman's review and photos here. He caught a photo of the teriyaki beef horfun! Haha.. I was looking through the my photos and realise I did not take the chicken wings too! yeah we should do this again... good fun meeting all! maybe next time i'll try to get more BP kakis to come along. Hello! can i go too? hahaha! 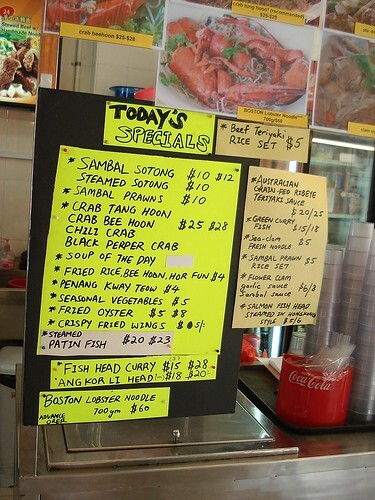 standard of the penang ckt seems to vary alot, my order did look half as good as yours!